Not to be confused with "Made in China". 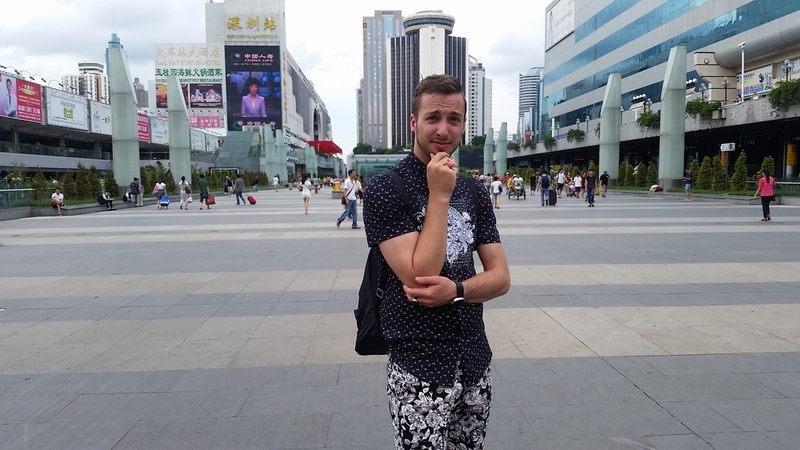 China surprised me. I had this preconception of a deprived culture based on textbook teachings and the occasional human rights stories filtering out on social media. All of the nope. Nothing was like I anticipated. From the luxurious greenery of the city (Shenzhen) to the shopping centers, architecture and even the people. The hospitality of the folks we spent the most time with at Seeed Studios was sublime. 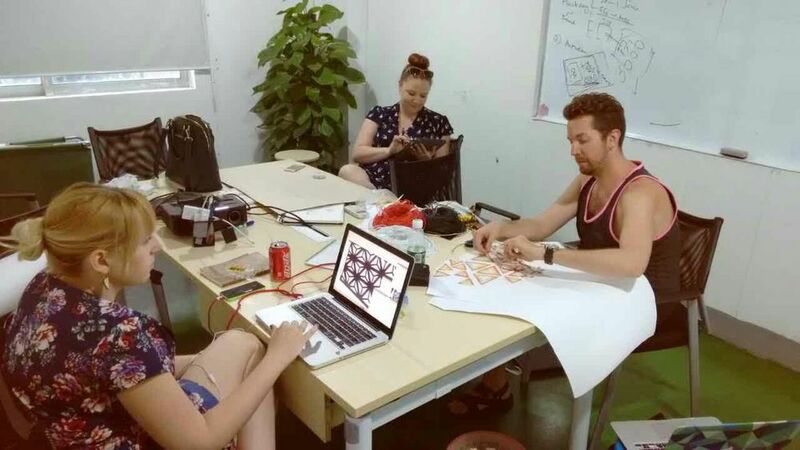 I was in China for close to a month starting on June 2, all to create Interactive Fashion at Seeed Studios for Shenzhen Maker Faire, now the second largest Maker Faire in the world after Bay area. 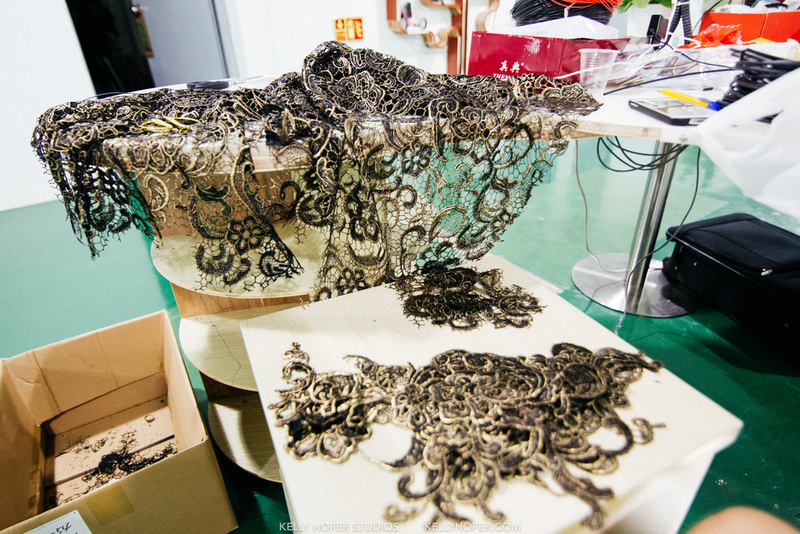 I was there under the name of MakeFashion and as an artist in residence at Seeed Studios. 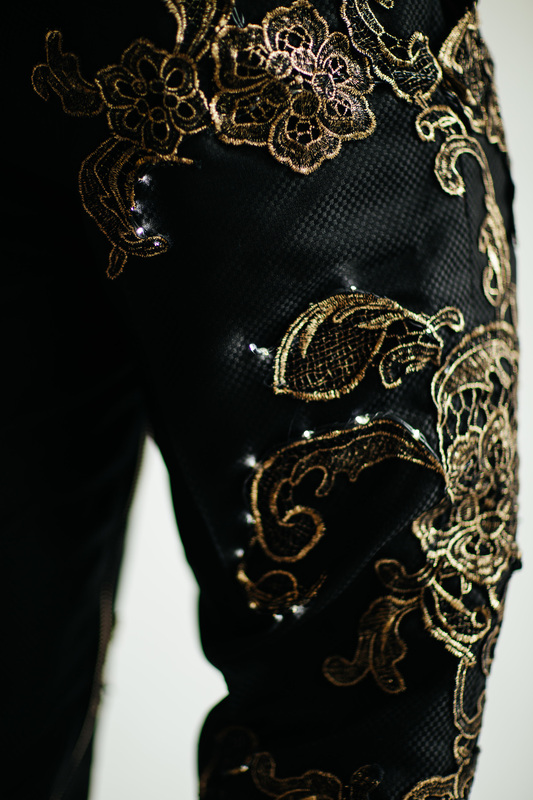 The final pants that I designed were shown at the Shenzhen MakerFaire. 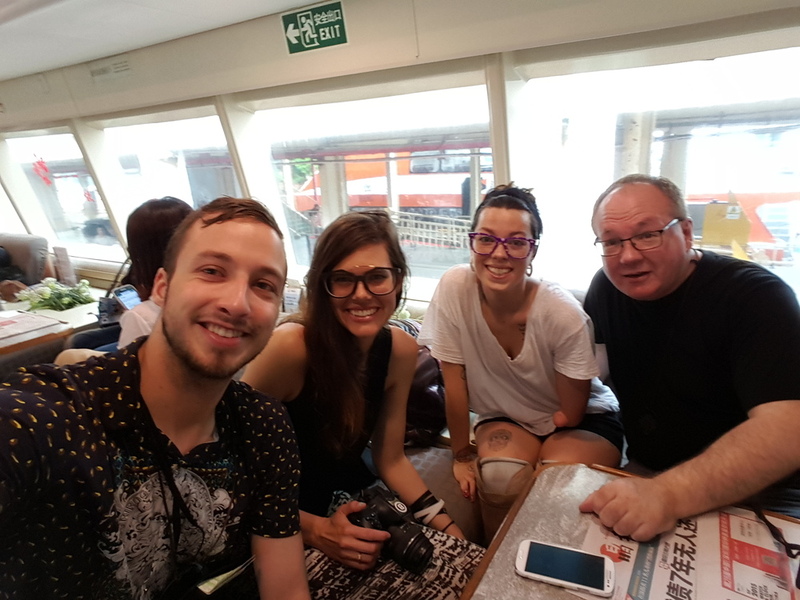 I traveled to Shenzhen by myself, a flight to HongKong Airport, then by ferry to the Shenzhen Shekou port, and then by fake taxi to my apartment in the Nanshan district of Shenzhen. n all fairness they warned me about the taxis that meet you at the door and usher you into their car, but at that time of the night my scam detection software was tired and turned off. So i paid 200 yuan instead of 20 to get to my apartment. At the end of the trip the whole MakeFashion team had arrived. Shannon, Maria, Paul, Catherine, Kelly, Kyle, Sophie, Stacey, Kenzie, Nadine, Zoe, and McCauley. We went fabric and suit shopping a little too often. The prices are just screaming at you to buy them. We all had custom tailored clothing made. I got two suites for myself. Two complete looks for a total of $400 canadian. And I now have a Tailor in China, I line I can casually drop when someone asks where my suite is from "oh, my tailor in China made it for me" no biggie. MyoLight - Using light to display muscle activity. 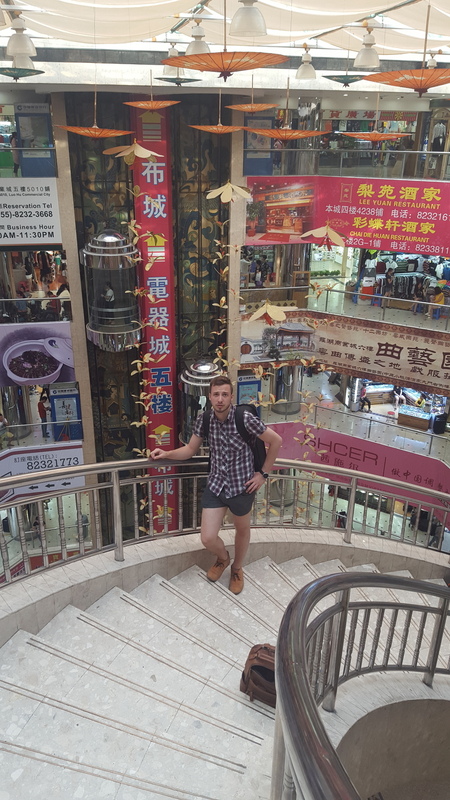 My goal in Shenzhen was to utilize the electronics markets, fabric markets and expertise at Seeed Studios to create a pair of pants that monitor muscle activity via EMG sensors and display it using Fading lights. The practical application for this could be for aiding rehabilitation of muscles, for dancers to build muscle awareness, and maybe even for babies to more quickly build the mental bridge between use of muscle and the action of walking. I don't know, but maybe! My first step was to head off to the Electronics District. Huaqiangbei. I went there with two of my chinese friends for ease of translation, and every time we entered a new floor or building my brain wanted to reject the enormity of it all. 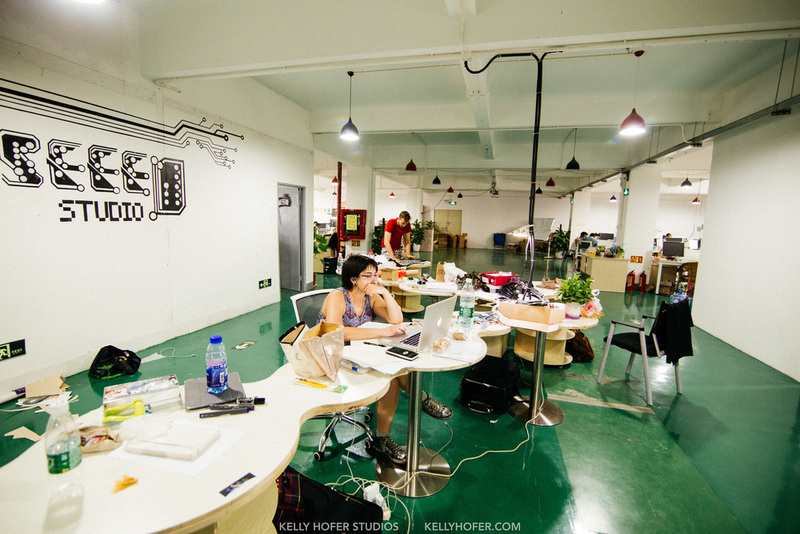 Look at the below image, this is 1/7 floors of 1/30+ buildings just filled with electronics. 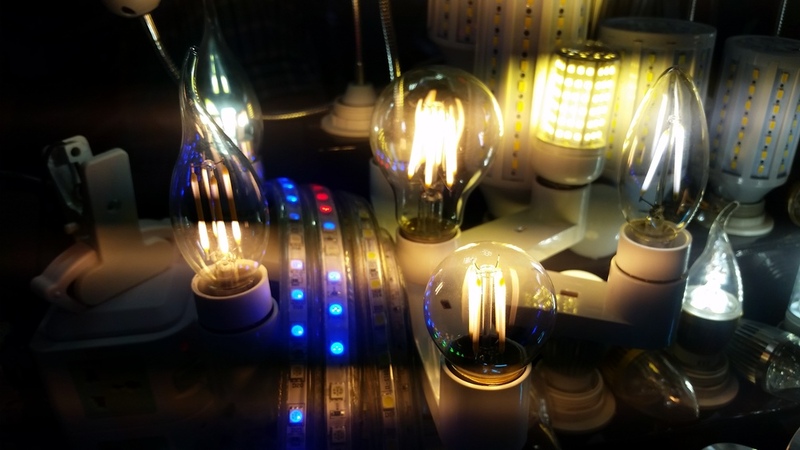 There is a whole 10 story building dedicated to led's and all the components needed to make them work. 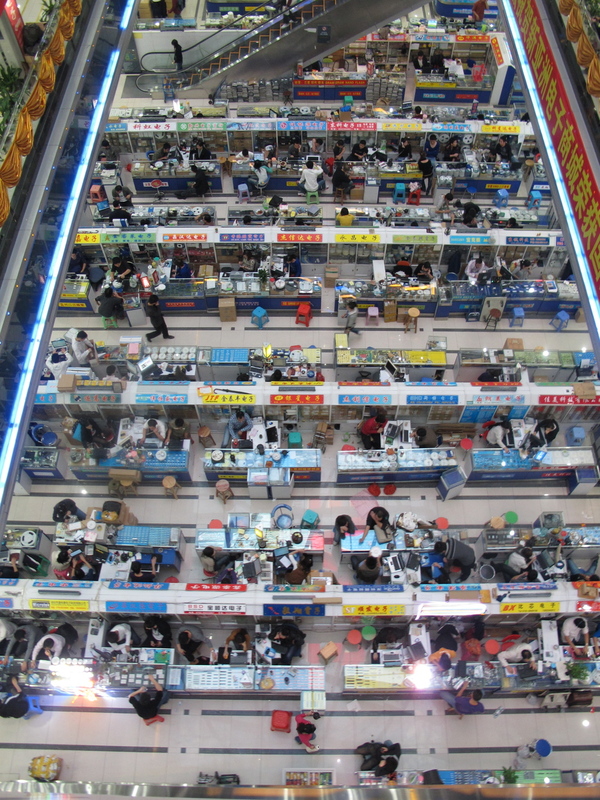 It overwhelms every sense of scale I had imagined when envisioning an electronics market. These vendors all represent one factory, and are not too interested in selling small quantities, they deal in !000+ quantities. 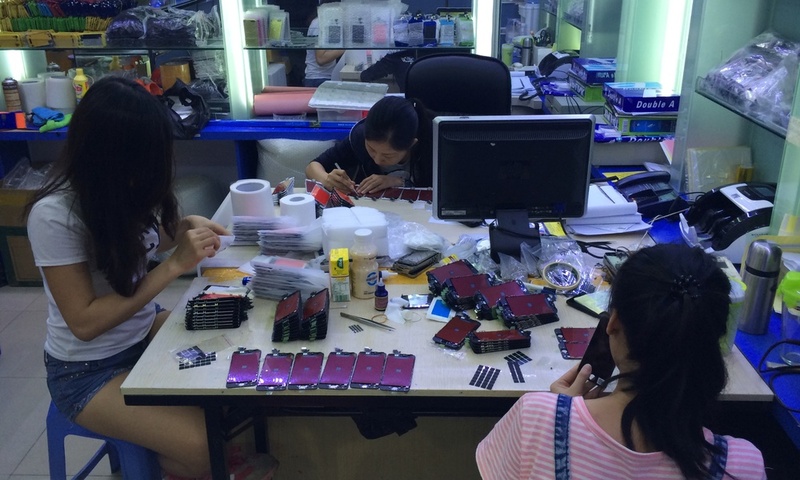 Even when buying a soldering iron, they asked "how many would you like?". One is enough, thank you. 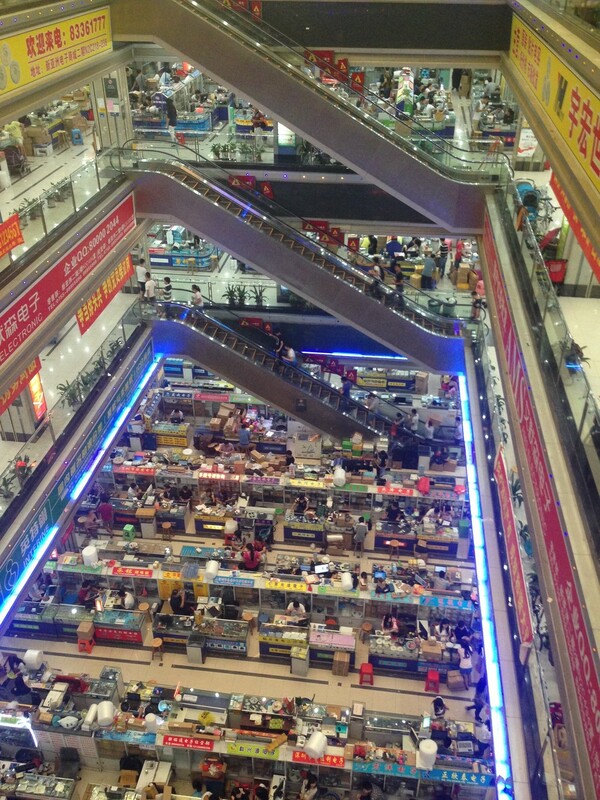 To compare this to electronics markets in Calgary for example. I cannot find any place to buy tiny surface mount resistors, at the Huaqiangbei Market there are entire vendors selling only one type of resistor. Hyperspecialization is totally normal and I love it. Anyhow, I spent multiple days shopping around, communications were difficult so we used a calculator. Quantity, Price, V, mAh, W, K, mAh/H, the basic electronic specifications were all one needs to know, along with their numerical indicator. 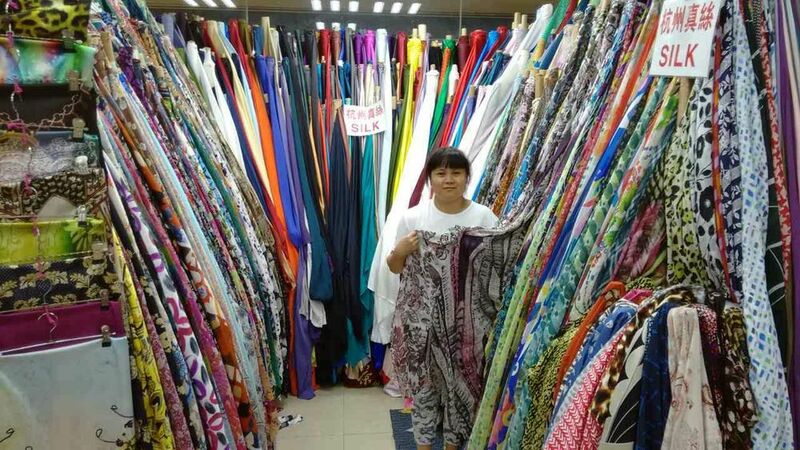 Haggling is totally a thing too, and I greatly enjoyed doing that. 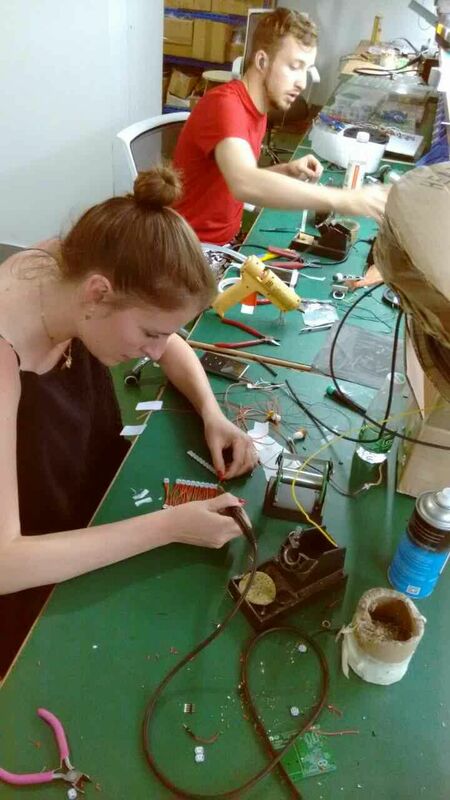 I started developing my vision for my MyoLight creation as I discovered new components, and techniques, things you can best learn by witnessing the variety of electronics at Huaqiangbei. Below are a few images of my initial layouts and work in incorporating EMG sensors, along with an arduino board and PWM drivers into a pair of pants. Let me describe how my pants work. So my concept was to amplify the output signal from the muscles (measured in millivolts) and use the signal to fade lights on a pair of pants in and out based on electrical muscle activity. 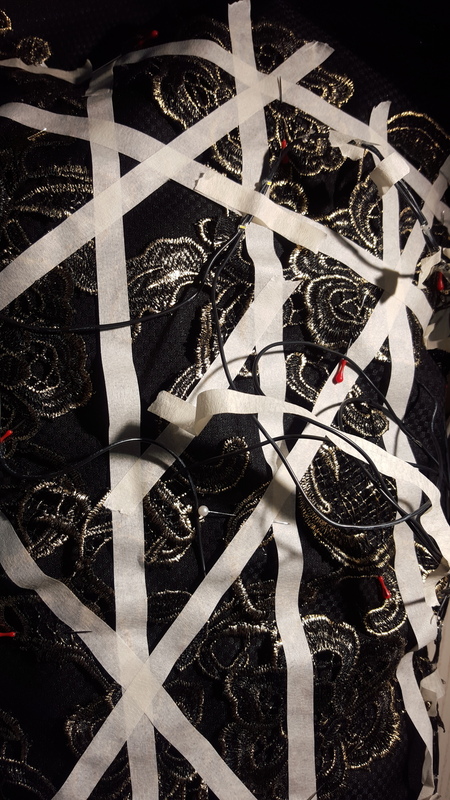 To read the muscle signal I used the Grove EMG sensor made by Seeed Studios. Well, I used 14 of them to be precise. Mapping major muscle groups in the legs. These boards were feeding their signal into a Arduino Micro which then processed the signal and output a PWM signal to a small Mosfet with a pull up resistor which drove a string of LED's that were sewn onto the surface of the pants. The signal was fed in via the Analog inputs and the signal output was via the PWM pinouts. There were two sources of power, one for the Arduino board and EMG boards(9.6V 6AA's in series), and a different one for the LED's via the Mosfets (3.4V, 4X2AA's). I used AA's vs LiPo's simply because of reliability, ease of replacement, and because they are available everywhere. The processing code was written by the uber skilled programmer at Seeed Studios: Pillar. For the construction, I glued the whole circuit onto a flexible Plastic board that slipped into the pockets and then had everything connected. with smalls connectors. There were very few soldering joints that were off the board which greatly increases reliability. I keep noticing this everywhere, the electronics industry is not set up for wearable tech. The circuits are not set up to be worn, everything is rigid, and square. 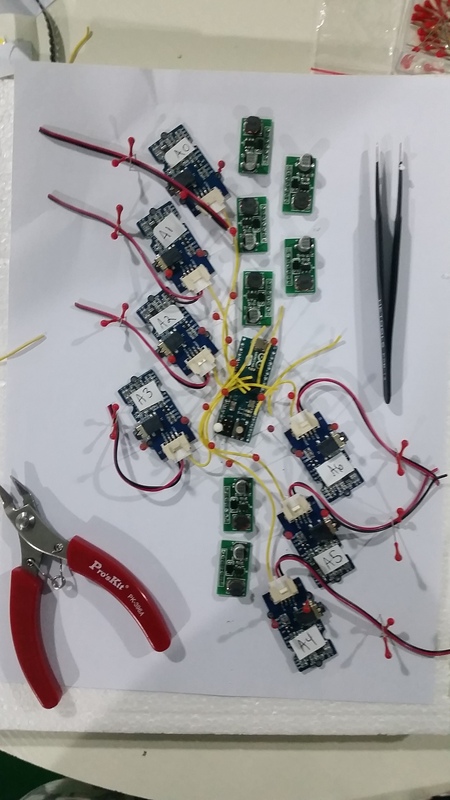 The connections are all solder, which is really breakable and unreliable. The wires are a stiff plastic rather than silicon wire. The connectors are sharp edged square blocks of plastic. 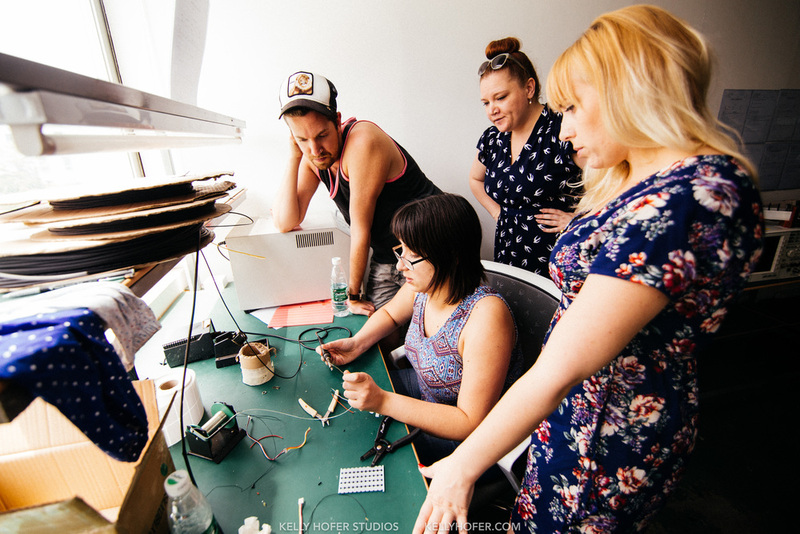 It's an endless stream of challenging materials to manipulate to best work in the wearable tech environment. 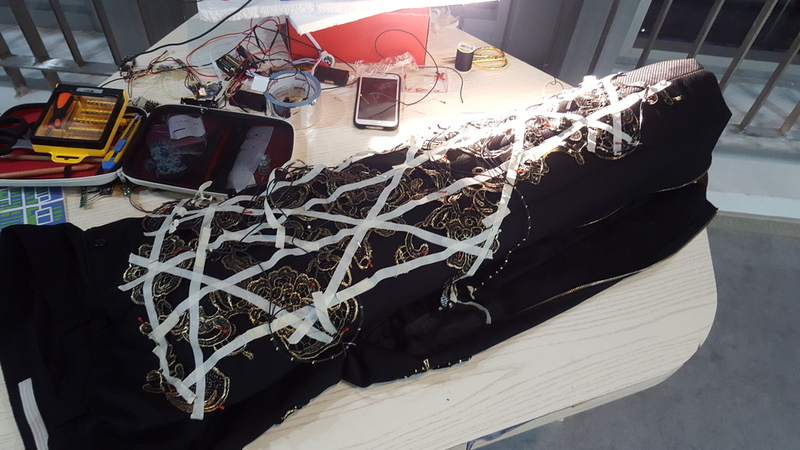 And that is arguably the greatest challenge when designing interactive fashion, using hardware designed for boxes and stable surfaces, and place them on the body, which has the most unpredictable qualities: sweat, stretching, bending, pinching and softness. I love noodles. I love Chinese food. But every day? can I have pizza please!! I learned the true value of Multiculturalism in Canada: the food they bring into the country. I can go to a vietnamese restaurant one day, then a japanese the next, then an italian the next and a canadian one the next. It's true variety and I have always taken it for granted, but once I experienced the lack of it as is in Shenzhen, I value what we have a lot more. Oh god. It was like revisiting the HBNI firewall that blocked out all useful websites on the Colony. Let me list the websites that are blocked in China that I use the most. Google maps, Gmail, Google Drive, Google Translate, Twitter, Facebook, Youtube, Dropbox, Instagram, Facebook Messenger, Play Store. To access any of these I used a slowass VPN which more often than not didn't work. They have substitute services for all of the ones listed, but it makes communicating with the rest of the world so bloody difficult. I don't understand the Chinese Government's decision to limit communications like that, it hinders relations with the rest of the world so much. However, if you love WeChat, then this is the place for you. If you plan on visiting China, get a good VPN before you arrive, and install a bunch of apps that you know are not blocked, like Pleco, WeChat, Waygo, Shadowsocks and many more. All of the good things. There are just soooooooo many high-rises in Shenzhen. Everyone lives in apartment blocks which Is really nice, the denser population fills the streets and forces food shops and everything to be everywhere. Unlike Calgary's pancake building principals. It promoted people to interact and I love that. The architecture in the major centers is quite astounding. Their atriums are 10 stories tall solid marble. LED lights everywhere lighting up their oddly short days. The buildings are either tiny packed shops or grandiose marble slabs of polished space. I enjoyed that juxtaposition. I'm imagining their thinking to be: Lets have the buildings be functional if need be, but every once in a while let's be overwhelmingly ostentatious. 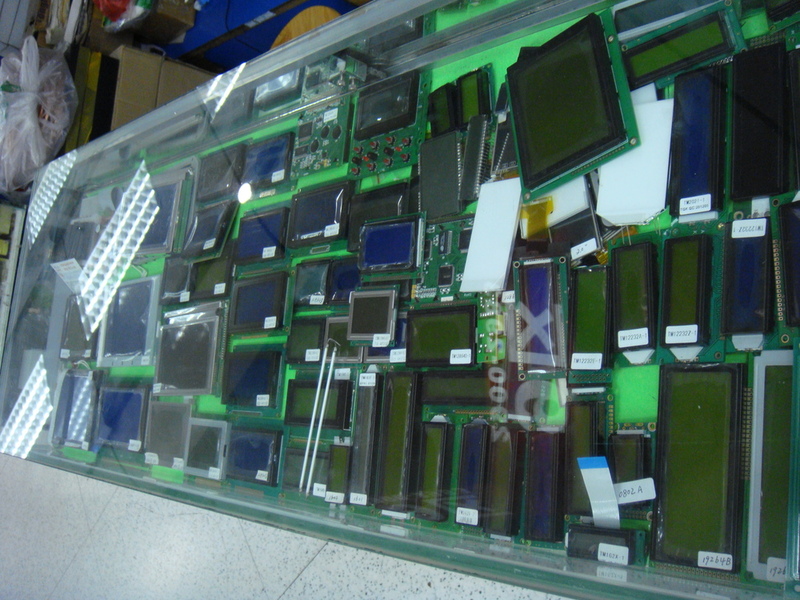 The electronics Market. I'm so envious of that, it's hard not be be innovative with that in your city. It's overwhelming how much choice there is. How cheap that choice is, and how far they've taken innovation in technology in that city. 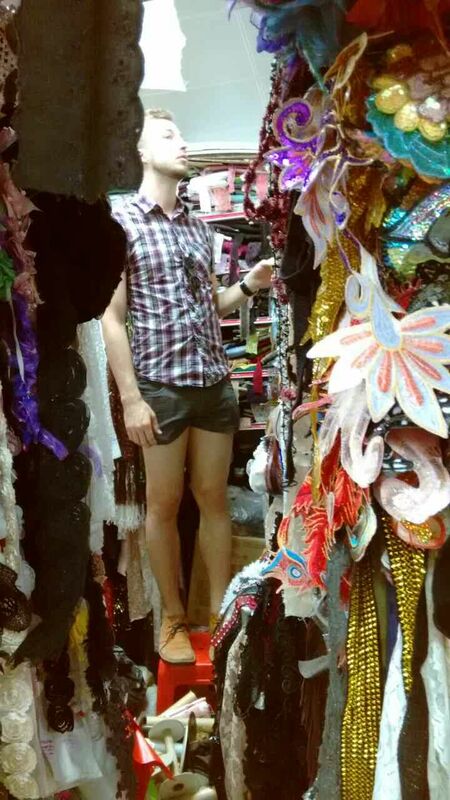 The fabric and knockoff markets are equally as overwhelming. Everything is just so inexpensive. However the constant hawking of vendors as I walked by just irritated me so I loudly rejected their offer with a harsh "NO!". The ones that noticed your interest in their product and then followed you around asking you what you wanted were especially obnoxious. It was like mosquitoes on a muggy day in Manitoba, I love attention but not from you. The greenery is mind blowing. You could travel down a major thoroughfare through downtown and see only trees, shrubs and flowers. The roads are inescapably encased in the lushest of greenery, with immaculately trimmed shrubs and fully blooming flowers. Even the overpasses had an endless stream of flower pots on the side to give the illusion of there being a garden in the air. Lovely, so very lovely. This is an entirely normal amount of roadside greenery. Some roads even more, being totally engulfed in trees. 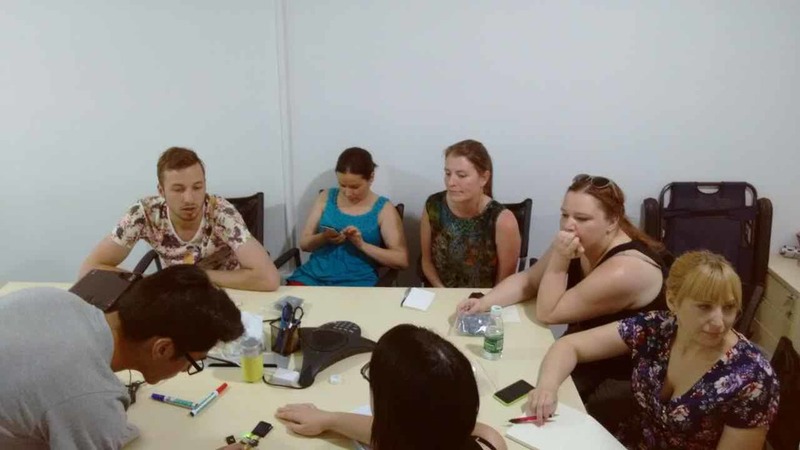 I do very much expect to go back to China to further explore and develop wearable tech. Till then, stay tuned for my MakeFashion adventures in Calgary.